figure 7.16 Section of Podocarpus urbanii stem showing thick cuticle (arrows), hypodermal sclereids (S), and stomatal chamber (C) (Extant). Bar = 50pm. 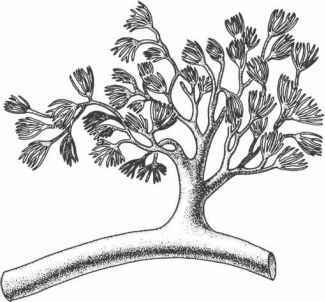 figure 7.17 Section of Yucca sp. leaf showing thick cuticle (arrow) (Extant). Bar = 50pm. atmosphere, and sometimes photosynthesis. 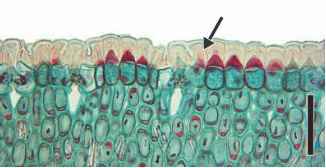 If a plant does not exhibit secondary growth, the epidermis may be retained throughout the life of the plant. In plants with secondary growth, the periderm will take over these functions as development continues (see section "Secondary Growth"). The epidermis is most often one cell layer thick, although there are exceptions. Epidermal cells are primarily parenchyma-tous, as they are alive at maturity, and most are compactly arranged with very few or no intercellular spaces. Covering the epidermis is the cuticle, a non-cellular layer which covers all the aerial parts of plants (FIG. 7.16); epi-cuticular waxes occur on the outer surface of the cuticle. The cuticle impregnates the outer cell wall of the epidermal cells, may form flanges between epidermal cells, and is also deposited on the surface of the cell (FIG. 7.17). It consists of varying proportions of two lipid polymers, cutin and cutan. Cutan is resistant to decay and was thought to account for the widespread preservation of cuticle in the fossil record (Chapter 1), but Gupta et al. (2006) have recently questioned this assumption after finding little cutan in some fossil leaves. 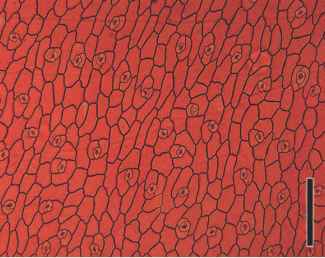 figure 7.18 Abaxial epidermal cells of Kalanchoe sp. with stomata (Extant). Bar = 350pm. What is the location of the stomata on the yucca leaf?